Courchevel Village. Set in a superb location on the edge of the Proveres piste and at the foot of the toboggan run, the exquisite Chalet Benjamin is an exciting addition to our Signature chalet range. For ultimate convenience you can ski back to the chalet at the end of the day. In the morning it’s a short, gentle walk downhill to the Grangettes Telecabine that accesses the whole of the Three Valleys ski area or some may choose to walk up the steps at the side of the chalet to enjoy the ski down. You can also enjoy the convenience of the free ski bus, which stops opposite the chalet and takes you to other lifts in Courchevel. Chalet Benjamin combines timeless Alpine architecture with plush modern conveniences. As one of three properties in our chalet development in Courchevel village (originally our Chalet Trois S), its pedigree is second-to-none. Chalet Benjamin is furnished to our highest standard and features a combination of natural stone, industrial-style metalwork and charismatic reclaimed timber in its architecture. On the first floor, an open-plan welcoming lounge invokes relaxation with its melt-into seating and a balcony with endless vistas over the Vallée de Bozel. 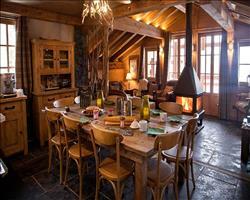 Feel at home as you enjoy our finest chalet cuisine around the reclaimed barn-style dining table. The luxurious wellness facilities; a sauna and an outdoor hot tub on the terrace with stunning views of the valley are an essential part of the end of your ski day and are not to be missed! All five bedrooms, furnished with handmade wooden furniture and warm, woollen fabrics, have the benefit of en suite facilities. The second floor bedrooms are in the eaves of the building and zip-lock beds in all but one of the rooms allow the flexibility of having either twins or king-sized doubles. The ease of access, facilities and design of this beautiful chalet make it an excellent choice for a thoroughly memorable ski holiday in the Three Valleys. In the four rooms that can be configured as either twin or king-sized beds, we will make them up as twins unless we are advised otherwise. This is a Signature chalet so you can enjoy extra features including a champagne reception, our specially designed Signature menu and additional luxurious extras. The beautiful chalets in our chalet development in Courchevel Village make an excellent choice for a memorable stay in the Three Valleys. We update Chalet Benjamin's details often, but facilities do change. e.g. some extras listed by the supplier as "free" or included might only be for the first time you use them, or for one time per party, then charged for further use. If any specific feature is essential to your holiday, make sure you ask us to confirm the details of it before you book your holiday. This package holiday to Chalet Benjamin in Courchevel, France departs Saturday 14th December 2019, for a 7 night stay on a "catered chalet" board basis. A local tourist tax (Taxe de Sejour or Kurtaxe) is levied by many councils in European ski resorts. It varies by standard and type of accommodation and is age dependent, so not everyone is charged. It's not included in the basic price of your holiday and is usually paid locally. For reference, the average charged in winter 15/16 was between 50p and £2 per person, per night. Courchevel lift pass price last reported as €218 (adult 6 day). Ask for a quote when booking Chalet Benjamin. Chalet Corelli Courchevel France, Gatwick to Grenoble 14th December. 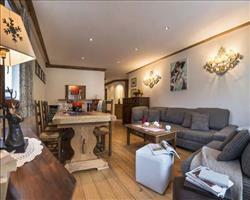 Chalet Estrella Courchevel France, Gatwick to Grenoble 14th December. 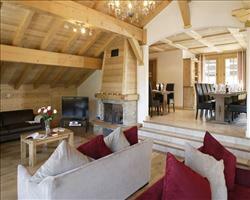 Chalet Jacques Courchevel France, Gatwick to Grenoble 14th December.